Eagle Crest 5th Addn. The best words that describe this CUSTOM built home is QUALITY & UPGRADES! This PEOPLE'S CHOICE AWARD home w/ stunning hand-scraped hardwood floors will WOW you! The tall cathedral ceilings & stone double-sided fireplace will catch your attention. The sparkling white kitchen will amaze you w/ Granite countertops, tile backsplash, new gas range, stainless appliances, farm style sink & custom built accent displays. The dining area is huge for entertaining w/ access to the East-facing covered deck & maintenance free fenced back yard w/ a patio off the walkout lower level. There is a security system & surround sound plus main floor laundry. The master bedroom suite has a huge soaking tub w/ tile surround & custom luxury tile shower w/ double decorative sinks & wall faucets. The huge finished lower level is perfect for a theatre room & pool table area w/ a walkout patio door, wet bar, above ground windows, 2 bedrooms, full bath, many storage areas & sprinklers. © 2019 Bismarck Mandan Board of Realtors. All rights reserved. Information deemed to be reliable but not guaranteed. 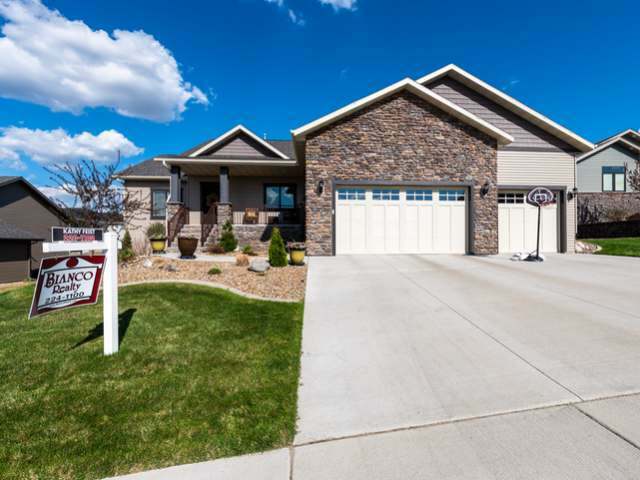 The data relating to real estate for sale on this website comes from Bismarck Mandan Board of Realtors and the Broker Reciprocity Program.sm. Real estate listings held by brokerage firms other than Century 21 Morrison Realty are marked with the BR logo and detailed information about them includes the name of the listing brokers. Listing broker has attempted to offer accurate data, but buyers are advised to confirm all items. Information last updated on 2019-04-21.